The porterhouse comes from the sweet spot on the loin of beef where you have both a NY strip steak and a tenderloin filet lined up across the T-shaped lumbar vertebrae from each other. It is actually two steaks that have not been cut apart. This is, of course, similar to the more pedestrian T-bone steak, but to be a “porterhouse,” the steak has to have a more substantial chunk of tenderloin—at least one and a half inches across, according to the USDA. The anatomy of having two different steak cuts separated by a bone makes cooking the porterhouse tricky. The tenderloin side tends to cook more quickly while the NY strip side takes a little longer to come up to doneness temp. And not only do the two types of meat want to cook at different rates, but the bone itself also poses a logistical problem. As the meat cooks, the muscle fibers tighten and shrink, making the bone stick out more relative to the steaks and moving the meat away from the searing surface of the pan. For this and other reasons, broiling under high heat in a cast iron pan is one of the best ways to cook a porterhouse. You get great heat on both sides of the steak leading to a killer sear. Before you get cooking, make sure your steaks are properly thawed. Use your Thermapen Mk4 to temp your steaks after a night of thawing in the refrigerator to make sure they are above 32°F (0°C) internal temperature. You don’t want to risk putting thicker cut steaks in the pan while they are still partially frozen inside. That would result in uneven cooking. As far as seasoning goes, a fantastic steak like this needs nothing much more than salt and pepper, so skip the spicy rubs and Montreal seasoning and let the meat do the talking. After all, that’s what you paid for, isn’t it? To broil a porterhouse, you need a hot pan and a hot broiler. Salt and pepper your steaks and then preheat your cast-iron pan (perfect for its high heat capacity) under the broiler for about 10 minutes, until it is literally smoking hot. At this point, open the oven and add a tablespoon of high-smoke point oil (such as corn or peanut oil) to the pan, enough to coat the bottom, then carefully place your steak in the pan. Slide the steak in the pan back directly under the broiler, ideally about 3-4 inches from the heating elements themselves. Cook each steak for about 3 minutes before checking to see how your sear is looking on the pan-side of the steak. Because the seared side of the steak will continue to be exposed to the high heat of the broiler after you flip it, you’re really looking for a nice golden brown crust, not a fully-formed crunchy brown crust when it’s time to flip. Searing the steak properly is all about the high heat of the broiler and the color of the steak surface but, of course, the internal doneness of your steak is all about the internal temperature of the steak itself. So, as soon as you flip the steak to sear the other side, take a quick read on your internal doneness with your Thermapen Mk4 (after the initial sear, you should be in the 80–100°F range [27–38°C]). This will give you a sense for how much longer you have to sear the second side without overcooking the interior of the steak. Keep in mind that thicker cut steaks like this porterhouse will experience up to a full 5°F (2.8°C) of carryover cooking after being removed from the heat. You’ll want to remember that when calculating your ideal pull temp (read here for more on steak temps). 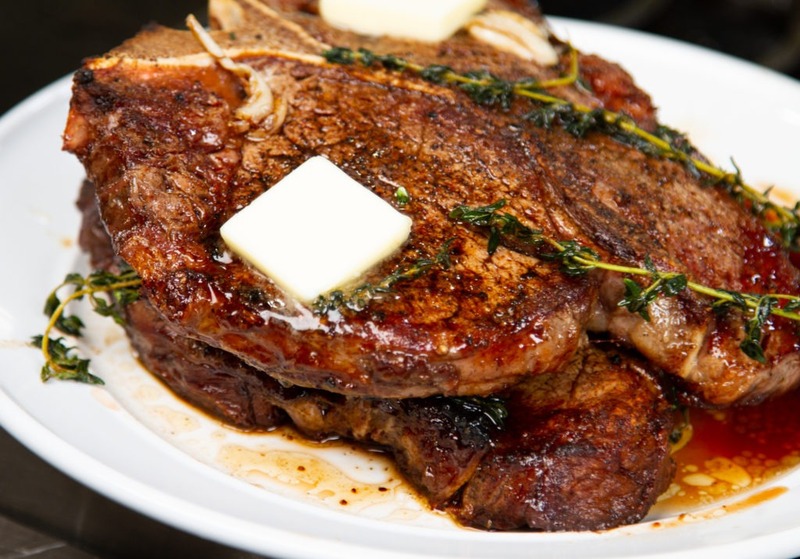 A beautiful porterhouse like this really is best cooked to medium rare, 130–134°F (55–57°C) final temperature, but you can cook it more to medium (135-145°F [57-63°C]) according to your individual taste. Broiling alone is acceptable but if you really want to give a steak like this some extra love, you can poêler it to finish. Poêler (pronounced PWAH-leh) is a French term that translates ‘to fry,’ and is chef-speak for basting something with hot melted butter—and, really, why wouldn’t you do this? To finish your steaks this way, pull them an extra 5°F (2.8°C) early, or a full 10°F (5.6°C) below your target finish temperature, and place the already heated cast-iron pan over medium-high heat on the stove. For our perfect medium rare, we pulled our porterhouse steaks from the second sear at 120°F (49°C) and put them on the stove. Add about a tablespoon of butter, a few sprigs of fresh thyme, and a crushed clove of garlic. Tilt the pan toward yourself using a good hot pad or silicone trivet to hold the handle. Use a large spoon to toss the hot, sizzling butter up onto the steak, allowing the garlic and thyme to sit on the steak, releasing their flavors into the hot beef fat and butter. Baste the steak in this way for about 30 seconds, and then remove it from the hot pan to rest. Resting the steak will be very, very difficult, as it will smell like, well, heaven, but it is a critical step to allow the steak to equilibrate and the juices to be reabsorbed into the muscle fibers. Once the porterhouse is finished and rested, carve and serve. Re: What Is A Porterhouse Steak? Use a large spoon to toss the hot, sizzling butter up onto the steak, allowing the garlic and thyme to sit on the steak, releasing their flavors into the hot beef fat and butter. Baste the steak in this way for about 30 seconds, and then remove it from the hot pan to rest. Only side dish permitted is potato --- mashed, smashed, baked or fried. No carrots, no string beans, no tomatoes, no kale. Maybe a smidge of grilled asparagus. Short answer: a nice snack. Dang! What do you enjoy for a full meal? It helps to have a nice Lobster tail with the steak. I have been known to knock back 54 ounces of steak with the trimmings. I have been kicked out of all-you-can-eat church dinners.